Positively the most memorable way to ensure that spectators keep your business card. Any spectator calls out a number, say between 40 and 100. The performer instantly draws a Magic Square on the back of his business card (or has a rubber-stamped grid of 16 squares already on it). With no false moves, the mental magician fills in all 16 squares of the grid and hands the card to the spectator, with a request to keep it for luck. He then mentions an interesting fact about the lucky piece the spectator now holds. If any row of four numbers, either across, down or diagonal, are added together, they will total the spectator's lucky number! And that's not all. The four corner numbers also total the same number. And same for the center block of four. 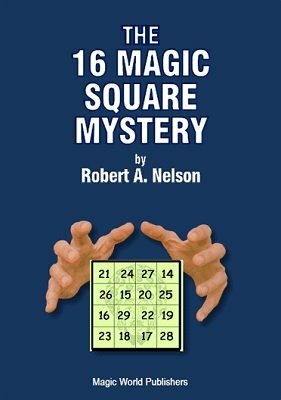 The Magic Square will intrigue any intelligent gathering of people. The secret method is impossible to detect. Unsurpassed for club, banquet, luncheon, stage and private demonstrations. Nelson's clear instructions, updated and improved with additional content found only in this edition, make it easy and clear to perform. There's no better way to get your business card or souvenir in the hands of prospective clients. Highly recommended. Are you a Nelson collector? This title was listed as No. 239 in the Nelson Enterprises catalog . 1st edition 1929, PDF 19 pages.